Q: Where is this tour? Where is Transylvania? Where is it based? A: To get there, search for flights in/out of Cluj (CLJ) Romania, on most airfare booking sites (such as www.lastminute.com). There are flights between Cluj (CLJ) and most major European cities or if you need assistance contact me. Q: I have my own bike, can I come? A: Yes! – see prices below. 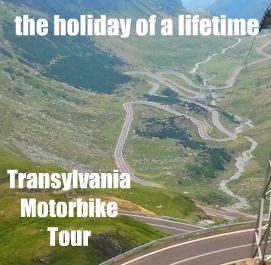 Do you need your bike transported to Transylvania? Are you riding there? Contact me to discuss the details. Q: Who is the tour for? A: This tour is for experienced riders and pillions, who can handle medium to large sized motorbikes. Have a look at the bikes page to see what is on tour. Naturally, you must possess a valid motorcycle license that allows you to ride legally in EU countries. Whilst the tour is on 100% paved roads, you should be comfortable riding in the rain and in traffic. If you come from Australia or the UK, don’t worry too much about riding on the “wrong side” of the road. It only takes a short time to get used to riding on the other side. A: Detailed list of recommended clothing will be sent to you once we receive the deposit, however as a minimum you need your riding gear to cover hot and cold weather conditions as well as your wet weather gear. You should also bring your mobile phone and have it set for international roaming or get a local sim card when you arrive. Q: How much riding is there per day? A: The tour length is about 1,400km so expect to ride somewhere between 150-250km/day. You can dictate your own speed throughout the riding days. Q: Can I stay longer to explore by bike? A: Yes, you can stay longer and hire the bike for extra days. We can assist you with accommodation and show you other attractions and places to ride if you are interested. Q: What is included in this tour? Q: What is not included in the price? A: Yes, contact me to discuss the details. How is my place confirmed? You contact me more than 6 weeks before your original event. Transfer in such case is done my sole discretion. Full payment is due 6 weeks before the ride. NOTE: it is up to you to ensure that payment is made successfully and in full. If you are unsure, please contact me. You can only transfer your ride and only if it is done 6 weeks before your original event. In such case, you can only transfer to another riding event if initiated by you and at my sole discretion. Yes you may, however you must contact me first and get my agreement for that person to attend the ride. Q: OK, I want to secure a position on this tour. How do I do that? A: Select the Book Online Now button below and follow the prompts. You can pay a deposit of EUR 200 to secure your spot. Deposit is non-refundable, but transferrable to another ride date. Your position has to be fully paid 6 weeks prior to your arrival date to Transylvania. can i bring my own bike, whats the cost then? Hi, i looked at your bike page but i do not see any rental rates associated with each bike. where do i look? Hi Dave, I do not have rental rates a I do not rent the bikes out, I supply the bikes to people who come to the tour. I have made some exceptions in the past, depending on how long and when you wish to rent. If you want to talk more about it, send me a direct email, via the Contact page.